When you want to fill your entire day up with gaming, a gaming magazine can do the trick. And if you're afraid that you've already read through the ones you've got, well, the latest issue of The Campaigner is now available for your reading pleasure. Head over and get your copy now. 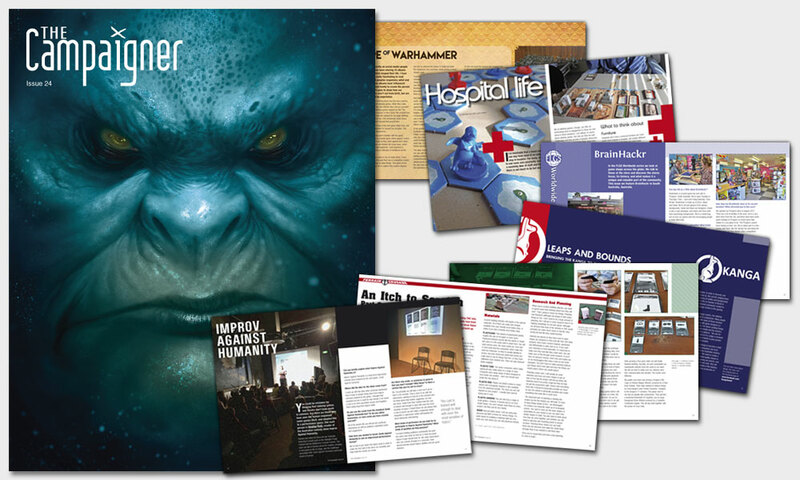 Whether it's waiting for friends to show up for game, or on your lunch break at work, or at a doctor's office, or wherever, you can fill up your day with gaming by grabbing a great gaming magazine. 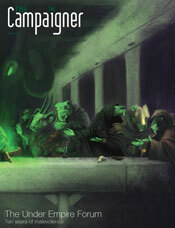 And Issue 26 of The Campaigner is now available for your reading pleasure. Filling your day with gaming is easy when you've got a gaming magazine. They're filled with all manner of helpful articles. And, in this case, you're in luck because The Campaigner Issue 25 is available now. When filling your day with gaming, you can't go wrong with a gaming magazine. They're filled with great articles about numerous topics to keep you reading and reading. And one of the best out there is The Campaigner. They've posted up issue 24 for your reading pleasure. Feel free to go check it out now. When snowed in and unable to go out and hang with friends, you might find yourself getting a bit stir crazy. Well, a way to keep those shakes away is to grab a gaming magazine. In this case, you can grab a copy of Issue 22 of The Campaigner, as it's available now. Downloading a copy's free, so why not check it out? Gaming magazines are a great way to fill up your day with all the gaming information you so desperately desire. In-depth articles on a rage of topics to help you find new games, or up your game, or increase your painting skill. 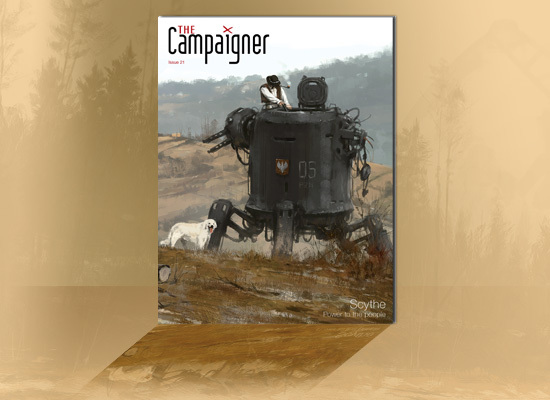 The Campaigner is certainly one of those types of magazines, and their Issue 21 is available now for your downloading and reading pleasure. Sure, we're bringing you gaming news every hour, but what about in-between those hours? If you want to fill up your day with even more gaming, there's those great gaming magazines out there. And The Campaigner has come out with issue 20 that you can download and check out, for free, so why not give it a read-over? We continue with our block of magazine release news posts with The Campaigner. Filled with a little of this and a little of that, from RPGs to board games to training your undead, there's a lot in these pages. If you're like me, from the moment you get up until the moment you go to bed, there's something gaming-involved going on. Whether you're looking at gaming news, watching some sort of review video, checking out a Kickstarter, or reading a gaming magazine, there's something going on gaming-wise. Well, to help fill a bit more of the conscious time, there's a new issue of The Campaigner out. I've not been feeling well much of the weekend. Yesterday I even went to the doctor. Now, my choices in the waiting room were months-old issues of Car & Driver and Esquire... or I could just read one of my gaming magazines that I've got. Thank you digital editions. That includes The Campaigner, whose issue 17 is now available. We've had a couple gaming magazine issues come out lately. Nothing wrong with that, obviously. Sometimes you want to hang out and just flip through a magazine while you hang out at the gaming shop, or are waiting for a dentist's appointment, or on the bus, or whatever. This time around it's The Campaigner that has released issue 16. As if one competition wasn't enough, here's another one. This time The Campaigner is looking for those that paid attention to Owen Top's terrain-building tutorials in their magazine. They're giving away the piece created for the Terrain Crusade issue, and only by showing you learned the skills can you get the prize. Nothing better than sitting in a comfy chair with a warm cup of cocoa and reading about some gaming on a cold, winter's evening. Granted, it's only getting down to like the 40s overnight right now here in Atlanta, and I don't have a "comfy chair" in my apartment (I do have a nice sofa, though), but that doesn't mean you won't find me with a cup of cocoa and reading about gaming. One of the things I can read is The Campaigner Issue 14, which is now available for your downloading and reading pleasure. It's another Guns 'N' Roses Weather Day here in GA. We've had one just about every day so far of this month. I'm certainly happy about that. Though I've never lived in the PNW, I've always sort of wanted to, and if popular media is anything to go by, it's like this 365 days of the year. Listening to Soundgarden and Nirvana when it's like this just feels... appropriate. Though it does mean that glue is taking longer to set as I try and put together this Betrayal at Calth set. But waddyagonnado? 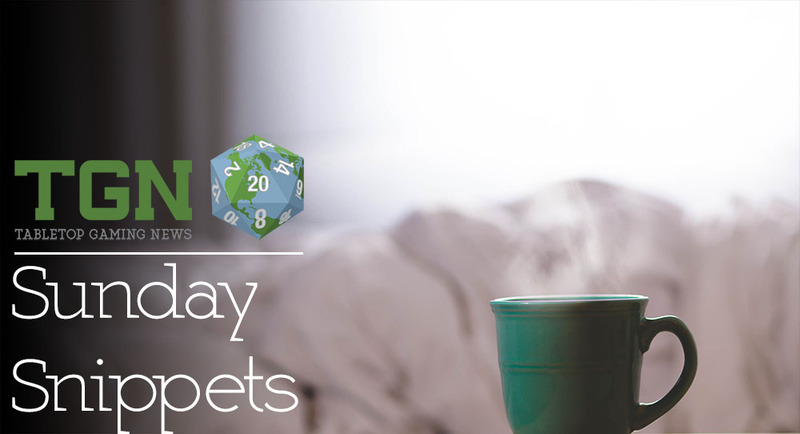 In the meantime, we've got a small batch of bite-sized stories for you today. 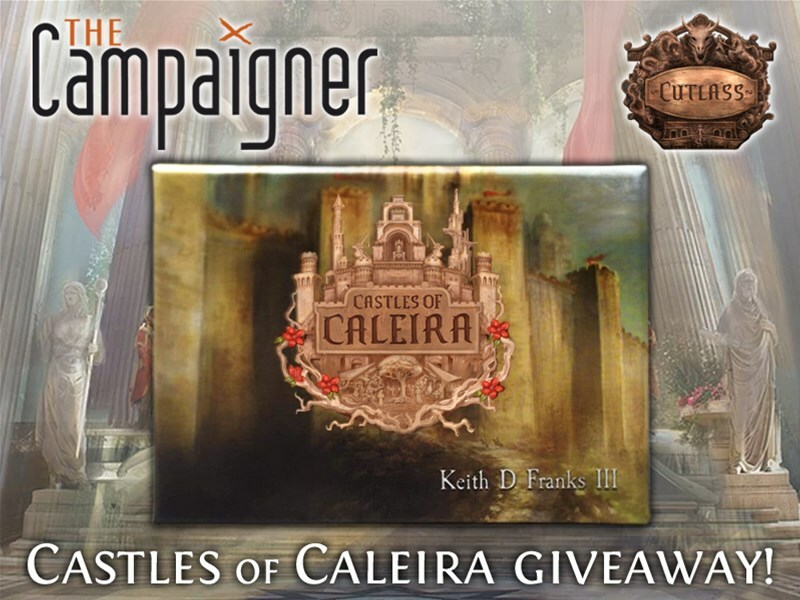 They include: There is still time to be a part of The Campaigner Survey 2015, Epic Generator Season 2 is Released, Deraj Studios Launches Slavic Fantasy Miniatures, and Aegis Studios releases Armory 1 under the Hero Kids Compatible License. It's starting to really get cool outside overnight. Literally speaking, soon the frost will be on the pumpkin. And that's here in Atlanta. I'm sure any of you gamers further north than I have already experienced such. So why not make up a batch of hot cocoa and huddle up next to the fire and read about some gaming news, eh? Laptops are nice and warm, after all. In today's batch of bite-sized stories we have: The Campaigner Survey 2015, Oddzial Osmy’s 3mm September Releases Arrive at PicoArmor - Including the B17, Oldhammer gets a new figure range from stalwarts of the gaming Industry, Creature College in its last week on Kickstarter, and Forgestarter Medieval Russians started. The 13th issue of The Campaigner is now available for your downloading and reading pleasure. And no, you don't have to worry about the 13th issue being haunted or anything. Besides, that'd be October-type stuff, and it's still only September. 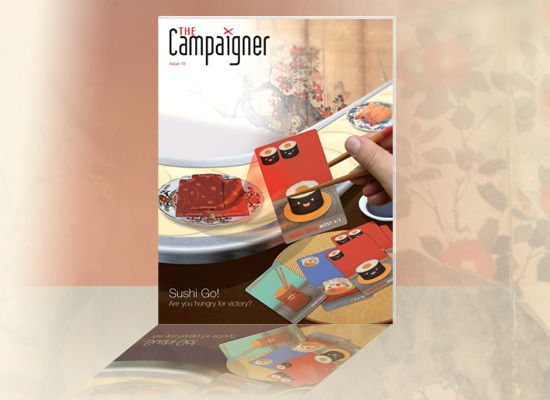 You can now go and download a copy of The Campaigner Issue 12 for your own reading pleasure. The download's free, so why not check it out? You'll get a bunch of really neat articles on a variety of topics. Or, if you want, you can get a print-on-demand version. Either way, there's good stuff to read inside. "Like what?" you ask. 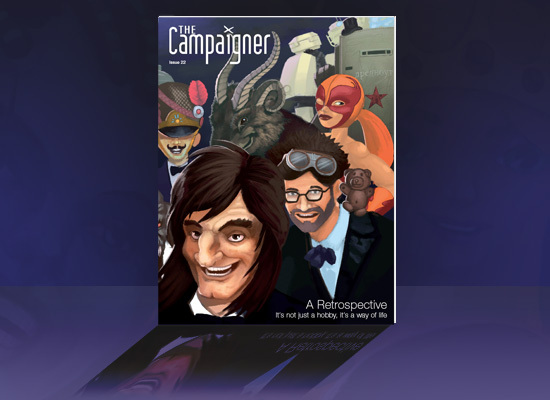 The Campaigner has issue 11 of their magazine now available for your downloading and reading pleasure. 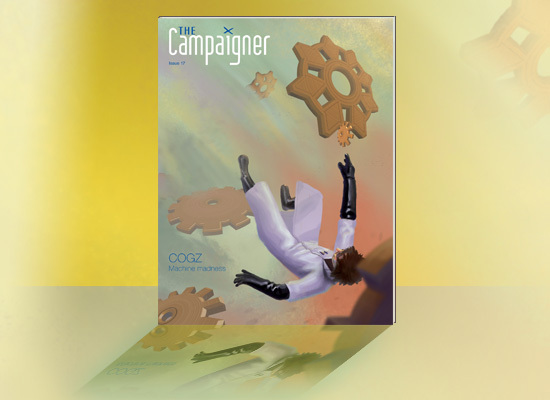 In this issue The Campaigner looks at the worker placement game Euphoria, explores its origins, and talks to game designer Jamey Stegmaier about its development. They also talk to Chris Avellone from Obsidian Entertainment about his previous career in tabletop roleplay, and he gives some pointers on creating amazing NPCs. Owen Top returns with Terrain Crusade, where he has a personal revelation that may shock you. Featured Hobbyist Liam Honan tells about his love of games, and provides some pointers on organising and running a game meetup. 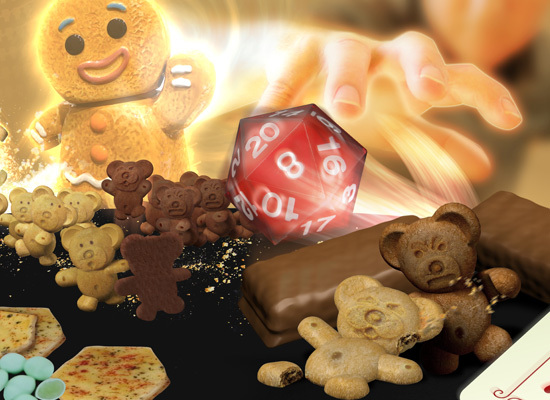 All this, plus Worlds of Roleplay, news and articles. 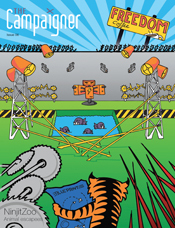 The Campaigner has released issue 10 of their magazine for your downloading and reading pleasure. 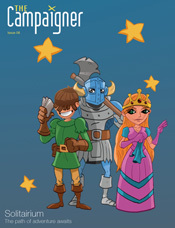 This issue includes Syrinscape creator Benjamin Loomes talking about his soundboard. 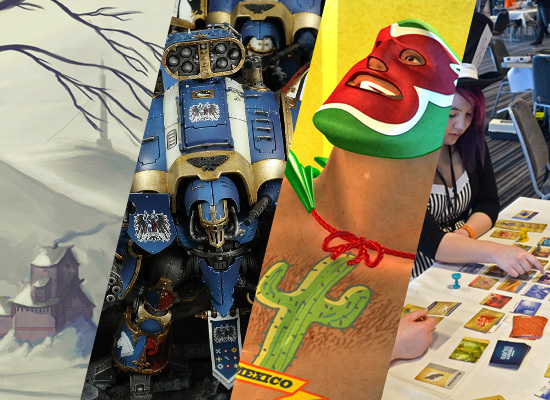 There's reports from a couple conventions (ConCentric and PAXAus '14). The Creative Challenge with Mark Soley is back. That and more within those electronic pages. 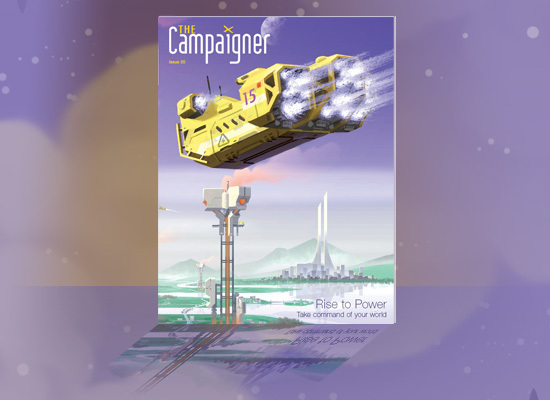 The Campaigner has posted issue 9 of their webzine for your downloading and reading pleasure. 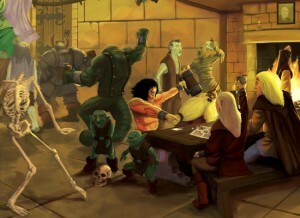 In this very special issue, The Campaigner celebrates the 25th anniversary of HeroQuest. We look at the game itself, who created it and some of its history, as well as explore the circumstances that led to HeroQuest becoming the legend it is today. 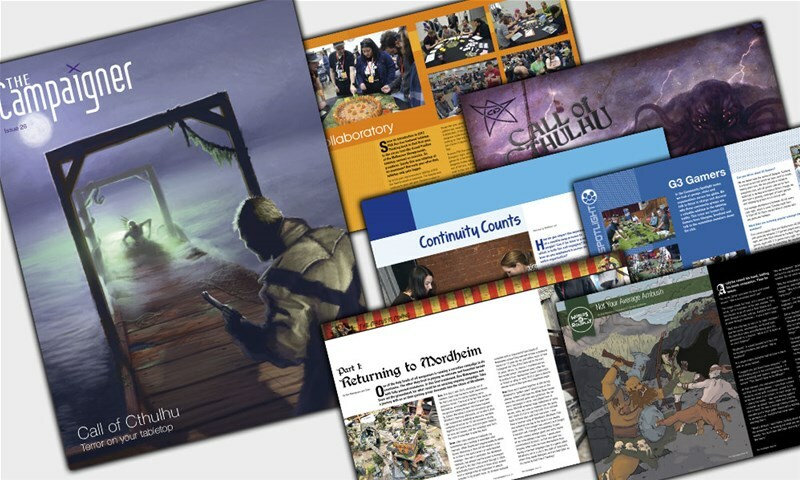 Les Edwards talks about creating the cover artwork, fans recount their experiences, and modern tabletop gamers put it through its paces. All this and more, including a very special edition of Gamer Dad. 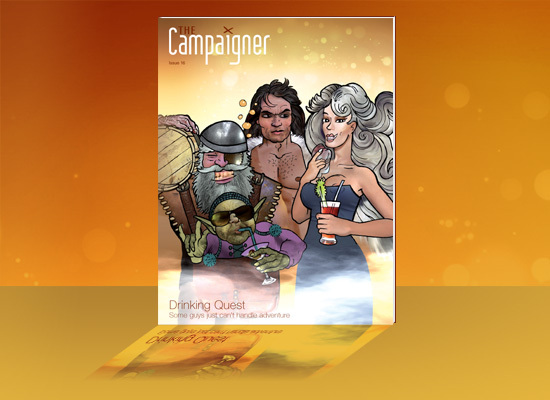 The Campaigner has released issue 8 of their magazine up online for your reading pleasure. 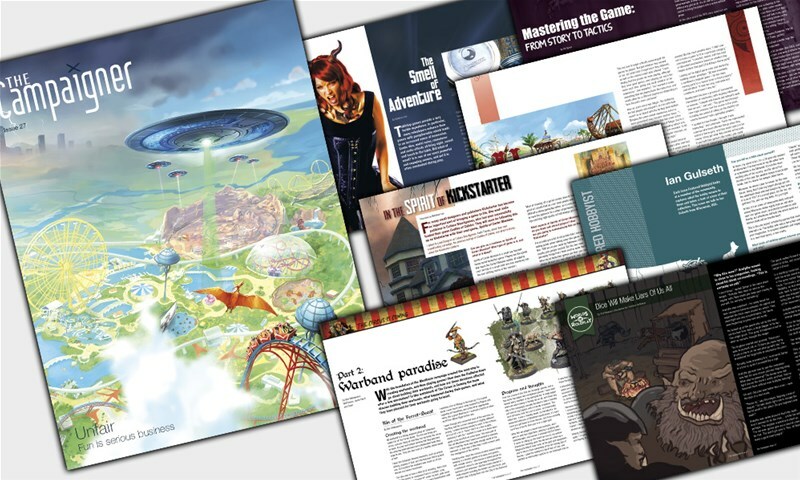 In this issue Andy Hawkins tells us about the inspiration and development of the card game Solitairium. 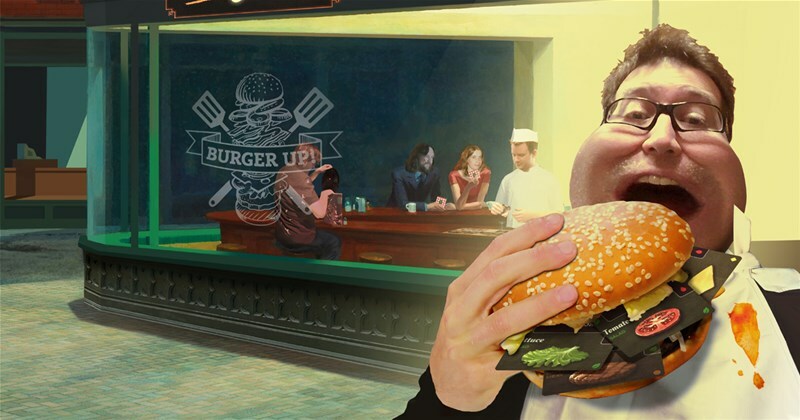 We talked to indie game darling Jamey Stegmaier about Stonemaier Games, Kickstarter, and how to win the hearts of gamers everywhere. Owen Top educates us in the finer points of commissioned scenery building in this issues Terrain Crusade. Dwarf fanatic Kera Foehunter tells us about the hobby for her, and shows us some of her amazing sculpting work, as this issues Featured Hobbyist. 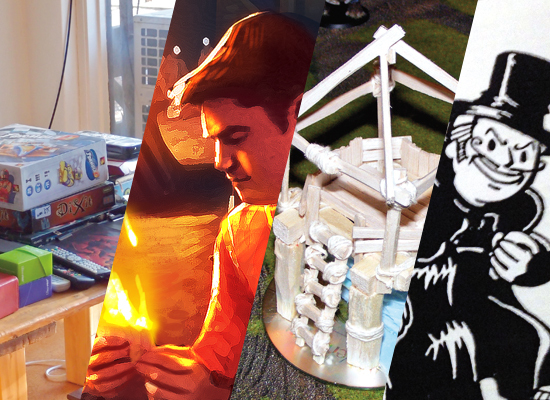 All this, plus more Gamer Dad, Worlds of Roleplay, tournament and painting competition photo essays, news and much more. 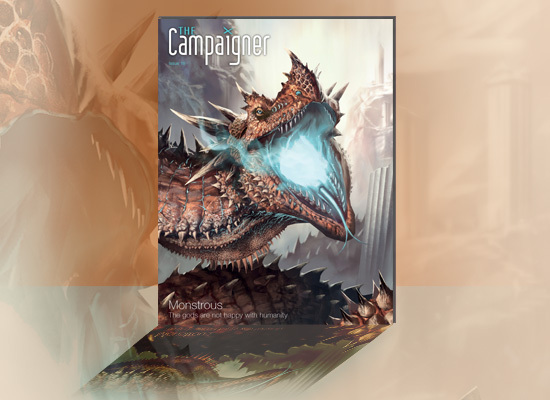 The Campaigner has released issue 7 of their magazine for your reading pleasure. This issue we look at The Under Empire Forum, and talk to those that run it about how they have kept this community alive for ten years. We discuss Monty Haul, a company that makes gaming tables, with owner Frank Bruzzaniti, and discover the trials and tribulations of bringing the world’s most versatile table to the hobbyists. Terry Masson and Owen Top explore CanCon 2014 in a breakdown of Terry’s experience, as well as a photo essay by Owen. Terrain Crusade returns, this time looking at how to include trees into your collection. 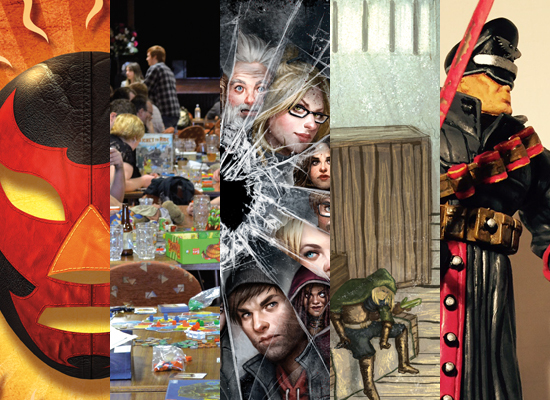 All this, plus more Gamer Dad, Worlds of Roleplay, opinions, news and much more. The Campaigner has posted issue 6 of their magazine up online for your reading pleasure. Beware, the animals are on the loose! Issue 6 of The Campaigner is now available for free download or print-on-demand purchase from Magcloud. This issue we look at the card game NinjitZoo, and talk with the creators at Blue Room about how they helped a group of ninja animals escape to freedom. We also talk to Andrew Sum, the developer behind Dungeon Dashers, and find out what it takes to get four adventurers fighting monsters and avoiding traps in a digital dungeon. Worlds of Roleplay continues as Foti Pitrikkos recounts his encounter with the Chain Devil. This issue Gamer Dad looks at how children think, and how understanding this can help you to better engage your Gamer Kids. 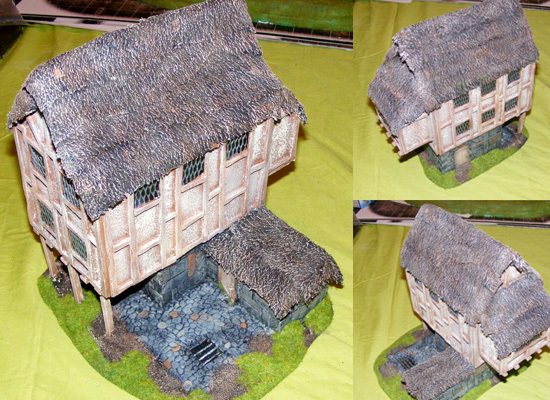 Owen Top weighs in on terrain, and discusses how to get building in the first Terrain Crusade. All this plus Featured Hobbyist Sam Phillips, Industry Insight, opinion articles, news and much more. 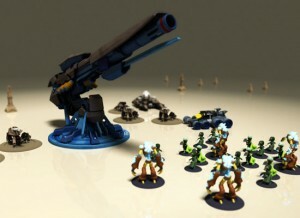 The Campaigner sat down and talked with the guys over at Proxy Army about their Proxy Wars Kickstarter campaign. Matthew at The Campaigner has a quick chat with Tristan from Proxy Army about their Kickstarter campaign and 3D printing.